Yes will perform as guests on the latest Artist Confidential special on SiriusXM satellite radio this week ahead of their induction into the 2017 Rock And Roll Hall of Fame on April 7. Hosted by Rolling Stone senior editor David Fricke, “An Artist Confidential with Yes” will air live on SiriusXM’s Volume channel (106) on Wednesday, April 5 at 8 PM ET. 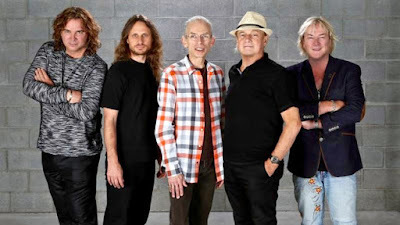 The hour-long event will feature a few acoustic performances and an interview with the current Yes line-up of guitarist Steve Howe, drummer Alan White, keyboardist Geoff Downes, vocalist Jon Davison and bassist Billy Sherwood. Howe and White will be inducted at New York’s Barclays Center alongside several members of the pioneering progressive rock group – including Jon Anderson, Bill Bruford, Trevor Rabin, Tony Kaye and the late Chris Squire – at the 2017 event with follow honorees Pearl Jam, Journey, Electric Light Orchestra, Joan Baez and Tupac Shakur. Geddy Lee and Alex Lifeson of Rush will induct Yes into the Rock Hall prior to a performance that former vocalist Jon Anderson recently hinted may include 1971’s “Roundabout” and "I've Seen All Good People", and the 1983 US No. 1 hit, "Owner Of A Lonely Heart."